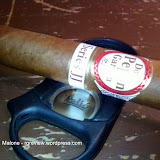 4 x 44 – petite corona – Nicaraguan puro with first generation Corojo ’99 and Corillo ’98 seed all wrapped up in a wonderful looking Cafe Colorado wrapper. 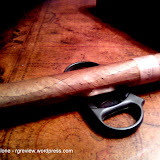 As I was reviewing the cigar per-light it had a good firmness to it, except a small length down one side. I was a little perplexed as Illusione’s are known for stellar construction. I cut the cap with my “new best friend” – my new V cutter. The draw was good and there was a nice sweet taste of tobacco. 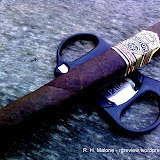 I lit the stick and was immediately met with a blast of spice, leather and a lingering sweetness. It was cold out so I started huffing it a little faster than I ought with the predictable bitterness entering the tasting profile. 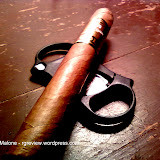 Your going to have to take your time with this cigar….and it will reward you. 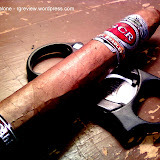 As the smoke progressed the flavors in the cigar kept switching prominence. That is, spice would start the tasting profile, then a sweet cedar would become more prevalent replaced by a nutty leathery note. Rinse, repeat. The most striking thing was this cornucopia of flavor keep expanding. It was truly a complex and enjoyable smoke. 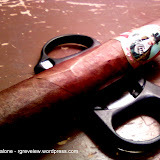 The only strike to the cigar was the irregular burn. As mentioned before there was a strange soft spot which effectively wouldn’t burn properly. Which lead to 2 touch-ups and much head scratching. As I was pondering this dichotomy it occurred to me that due to the weather, i.e. 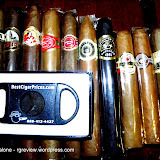 dry winter clime, my humidor might be a little “out of whack” which would lead to the cigar being on the dry side. This in turn could lead to the tobacco leafs becoming less firm, ergo, soft spot. The issue so perplexed me that I ventured to other review sites and lo and behold they had the same issue too. However, don’t let burn issues deter you. 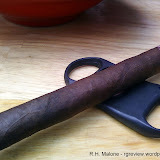 This is one fabulous smoke and being able to smoke a complex smoke in under 1 hour can, at times, be a good thing. I tend to recharge my beads about twice as fast in the winter as I would in the summer/spring time. In the winter I’ll recharge about every 2-3 weeks, where in the summer months it’s about every 5 or so. Glad it was enjoyable nonetheless!